It began as a sniffle...turned into a chesty cough and the next morning....a full fledged fever of 102! First my daughter...then my husband...then me. The little guy seemed spared. Two days later his temperature hit 104! It was the first weekend in a LONG time...no computer, no running, no playing, no cooking, no wine...no fun! Misery. The kind of cold/flu you think you'll never recover from...where you look at your ailing young and you yourself sick...feel helpless. Assuming this is the "new normal" you begin formulating ways you'll survive. You blame people. Dream up conspiracy theories. You dislike anyone and anything you came into contact with within the last ten days. You plot ways you'll seek your revenge. The bright sun and soaring winter temperatures piss you off. You resent the whole world for moving on and going about their daily routine....while you and your family are left sequestered...not at home...but rather in a germ infested house you don't even recognize! A house with walls (that desperately need painting) closing in on you...getting tighter and tighter by the second with - NO - WAY - OUT! So that about sums up our weekend. How did you spend yours? Please excuse the somewhat simple and inexact recipe that follows...I'm still not feeling great today but wanted to slowly attempt getting back to normal. Mix together 3.1 ratio quality mayonnaise to sour cream. Add diced dill pickle, fresh chopped parsley, fresh lemon juice, touch of Worcestershire Sauce and pinch of cayenne to taste. Drizzle over roasted potatoes and enjoy hot or cold! Being sick is the worst. Especially when you realize that indeed you need to paint and you feel like you'll never be strong enough to hold a paint roller or brush again. the horrors of having to live out the rest of your miserable sick life in a poorly painted room is just something that I can't imagine. I'm glad you're feeling better. the potatoes look good! I am sorry you have been sick, and I pray you are back to feeling great again soon. Sick or not, you have posted a great recipe! I will be trying this next week! I'm really happy you are better---hope your family is, too. A day without Design Wine and Dine is like a day without food! Welcome back! PS Your potatoes look fabulous! Sorry to hear you are sick. Get well soon! who doesnt like potatoes ?! i really hope you get better..
What a nightmare...the worst is feeling awfully sick and having to take care of others when you just want to lie in bed and pass out, like you used to do before the family and never appreciated. I hope you are all on your way to recovery. After my son's 5th day of fever I thought it would never end but luckily it disappears suddenly as it comes, assuming it is the same virus sneeking around the Old Continent. Wonderfully conforting yet fancy looking potatoes. You poor thing...hope you are all on the mend now. Being sick is definitely no fun..and when the whole family gets it, UGH, that's even worse!! 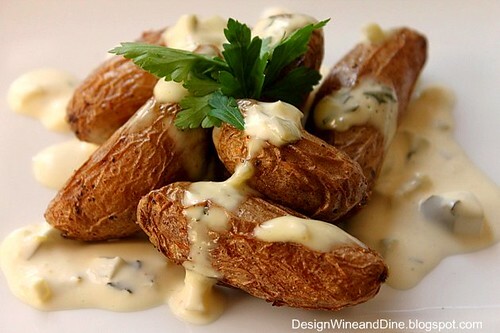 I love the simplicity of the sauce over these potatoes! It sounds delicious! i hope you are feeing better my friend:) i love this potatoe recipe! it sounds just delicious:) thanks for sharing this. I am so sorry you are all sick. Fever stinks. I hate it, especially when my son has it. I hope you will become well real soon. Just get some rest and drink many fluids including soup. The potatoes are great!